I LOVE to grill out! Even though we have had a lot of rain this year, there is nothing that says summer like firing up the grill and preparing something WONDERUL!!! One of my favorite summertime meals is my Marinated Grilled Chicken Fajitas. They are so simple AND flavorful. Not to mention easy on the wallet! I can't wait to show you how I make them! To begin, you will need to add the oil of your choice to one of the mixing bowls. Then, to that same bowl, you will add the lemon juice. Next, add 3/4 of the chopped cilantro. After that, the minced garlic. I saw this trick on the Food Network, and I have to say I am a fan. You just grate the garlic using your microplane. Now comes the Worchestershire...Worshestershire...Worcestershire Sauce. We can't forget the brown sugar. Now for a little pinch of salt and pepper to taste. pour half of it in a separate cup. Season the chicken breast with salt and pepper. Then add it to the marinade in the mixing bowl. the fridge for at least 30 minutes. Now it is time for the vegetables. Add the prepared veggies to the second mixing bowl. Pour the reserved marinade over the vegetables. Now it is time to head out to the grill! Now you can turn the burners to medium/high. vegetables on a grill pan or in a foil packet on the other. Close the lid and let the chicken cook for 6-8 minutes. and cook for another 6-8 minutes. Remove the chicken and let it rest for about 10 minutes. wrap them in a towel. And place the peppers and onion into a bowl. Set up a little assembly line, and let everyone make there own! This is a great way to get the whole family involved! Be sure to include some crumbled Queso Fresco, Sour Cream, Black Olives, Avocado, all of your favorite toppings! 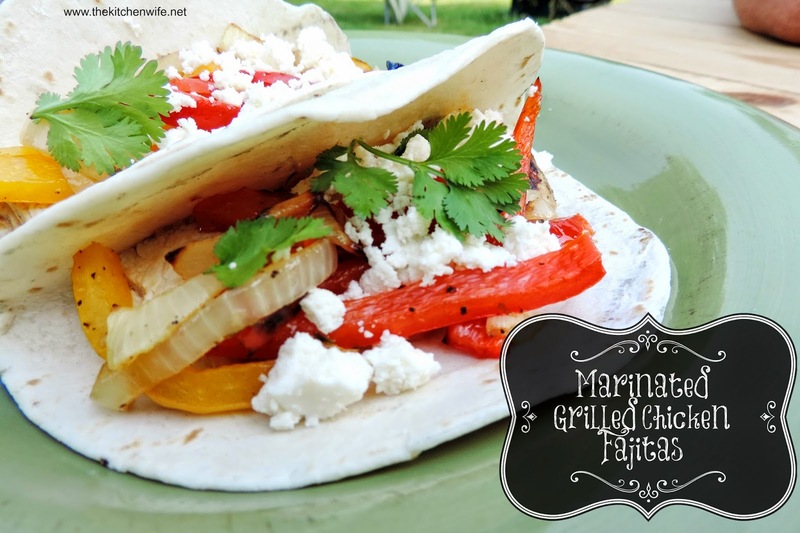 The flavor and freshness of these Marinated Grilled Fajitas can't be beat! I know you and your family will love them so give them a try tonight! Now comes the Worcestershire Sauce. Before you add this marinade to the chicken, pour half of it in a separate cup. Then add it to the marinade in the mixing bowl. Make sure the chicken is coated well, cover, and place in the fridge for at least 30 minutes. Now it is time to head out to the grill! You will want to turn the burners to high and allow the grill to heat up for 15 minutes. Then brush down the grates with a wire brush and, using and old towel, oil the grates. vegetables on a grill pan or in a foil packet on the other. Close the lid and let the chicken cook for 6-8 minutes. Then turn the chicken over, toss the vegetables, close the lid and cook for another 6-8 minutes. turning them frequently. When they are all toasty and warm, wrap them in a towel. Now you can slice the chicken and place the peppers and onion into a bowl. Serve with your favorite toppings and ENJOY! Hey Y'all! I'm Mandee also known as The Kitchen Wife! I'm a West Virginia girl, wife, dog mom, and planner addict, and all around seasonal living junkie. To me faith and family are everything, and the simple act of preparing a meal for someone is one of the greatest gestures of love you can offer. So take a look in my recipe box and make something delicious tonight! © 2017 The Kitchen Wife. Justine Template designed by Georgia Lou Studios All rights reserved.